On Monday 12 March 2018, it was a double bonanza for the Indian economy as the CPI inflation for January eased to 4.44% from 5.1% in the previous month and the Industrial Production (IIP) for December expanded to 7.5% from 7.1% in the previous month. But these are not only the factors looking up in the economy. 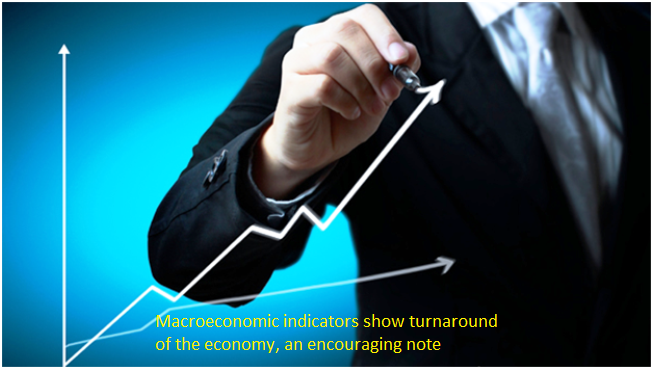 As the country is entering into a new fiscal, key macroeconomic indicators show a strong turnaround of the economy after being disrupted by the implementation of the Goods and Services Tax (GST) and demonetisation. India�s Gross Domestic Product (GDP) which slumped to a three year low of 5.7% in the first quarter of FY18, is looking up, with the growth recorded in the third quarter at 7.2% and full-year projection being revised to 6.5% from 6.3% earlier. The forecast for next fiscal being pegged by experts is between 7.2% to 7.5%, fastest GSP growth in the world among major economies. India�s direct tax collection until January showed a remarkable growth. The direct tax kitty swelled to Rs 6.95 lakh crore, a growth of 19.3%. While the net collection of corporate tax showed a growth of 19.2% and personal income tax (PIT) grew at 18.6%. On the indirect tax front, the GST revenue also seems to be stabilising after drastically falling in the month of October and November. The GST collection in January, until February 25 was Rs 86,318 crore, slightly lower than Rs 86,703 crore collected in December 2017. The collection had fallen to Rs 83,000 crore and Rs 80,000 crore in October and November respectively. India�s eight core sectors including IT, manufacturing and transport added 1.36 lakh jobs on net basis in July-September of the current fiscal. Construction was the only sector that reported a job loss, but overall this job creation was more than double as compared to the previous quarter. Of the total job creation, the job created for female workers accounted for 74,000 and male workers for a change of 62,000. Under the Insolvency and Bankruptcy Code (IBC), accounts with a huge amount of non-performing assets are currently undergoing resolution, of which NPAs worth Rs 1 lakh crore are set to be resolved soon. The strategic disinvestment of sick PSU companies got the company more than the targeted amount. As against disinvestment target of Rs 72,500 crore, the government achieved at least Rs 91,252.6 crore on the back of ONGC-HPCL sale. For the next fiscal, the government has set a modest increase the in the disnvestment target to Rs 80,000 crore. Corporate Earnings in the third quarter of the current fiscal showed signs of a pickup, with net sales growing much above estimated by 15.23% year-on-year. The surge also drove up the EBITDA margin. The CPI Inflation in the month of February eased to 4.44%, which the analysts are saying will ease pressure on the Reserve Bank of India from hiking rates in the April monetary policy meeting. The inflation relaxed on the back of lower food prices and seems to be stabilising after hitting a 17-month-high of 5.21%. After growing at 2.2%, the Industrial Production showed a remarkable growth by growing 8.4% in the month of November, slightly dipping in the month of December to 7.1% but rising again in January to 7.5%. Of the eight factors listed above, NPA reduction, unlike the other factors, seems to rest on theoretical assumptions; more of promise than of performance. Of course, the situation is mature enough to turn promise into performance; all the same, performance cannot be substituted by promise. Notwithstanding this one thought, the growth of Indian economy is firm and indisputable. Why the rulers only, so called the ruled also must cheer up with this story.